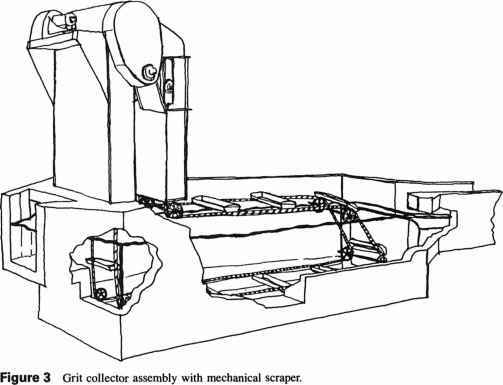 Landfilled material will gradually change in form and will exhibit different engineering and physical properties as a result of various environmental factors. Witmer and coworkers [7,8] reported the garbage decomposition process for a 10-year period as reflected on a particle size distribution curve. 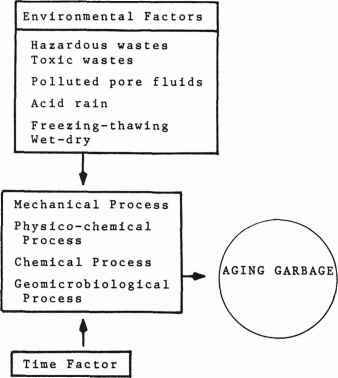 The aging process from fresh trash to aged trash along with the environmental and mechanical factors are illustrated in Figure 1. Mechanical processes do not directly contribute to the decomposition process. Compression of landfill materials due to the weight of the overlying landfill materials (self weight) may result in significant settlement in a landfill area. Additional settlement results from additional loads such as surcharge loading from landfill cover materials, snow, and downward percolating rainwater. Since the refuse is nonhomogeneous and contains organic matter, the settlement in the landfill areas is also nonuniformly distributed. Because of this differential settlement, the top seal (the landfill cover) is subject to cracking. Surcharge Compac t ion Rainwater Snow, etc. Figure 1 Aging process (geomorphic) stages between fresh and aging garbage. Leaching and ion-exchange reactions may significantly affect soil properties. Such soil property changes occur when rainwater or drainage processes remove some soluble clay minerals in the clay liners or around the landfill site by leaching. During this leaching, mineral elements such as calcium, magnesium, nitrogen, potassium, and phosphorus may be removed. The leaching process in turn reduces the cementation of the soil matrix and/or changes the ion concentration within the soil-water-electrolyte system and may result in significant changes in the properties of soil. During the biological decomposition process in the landfill, the temperature increases. At elevated temperatures, sulfate concentrations increase. The problems result from the reduction of sulfates to hydrogen sulfide (H2S). Hydrogen sulfide is the cause of corrosion of various underground structural members. In sanitary landfill areas, the refuse is nonhomogeneous and contains a large amount of organic matter, generating biological changes caused by decomposition for many years. There are five stages related to the biological activity in the landfill . Figure 2 shows a schematic diagram illustrating the cumulative settlement due to decomposition of organic matter versus time. What is decomposition of refuse?